Nice work as usual Dave. For some reason your recent picture posts, since you got your new bike, have come out HUGE. Not being a computer guy I don't know if it's a setting on my end or not. Life's a journey not a destination. Enjoy the journey! I think its on my end, a setting when I transfer them to the computer. They are a larger size. Took some stuff to the powder coater yesterday. Items like my hand guards and cup holder where paint was chipping. Some more vent screens also. 2003 Fatboy, real fire paint set, 95"
Great looking bike Dave... FYI, on the custom dynamics front signal lights you don’t have to remove the fairing. If you move the existing bulb slightly toward the outside and use a small flat head screw driver you can move the tab enough to disconnect the factory bulbs. You are correct in it is very tight and a little difficult to navigate. The first set I changed I called CD and they told me how to remove the factory bulbs. I took mine all apart. It sucked!! ...same here but it was worth it. Ok, that is interesting to know. 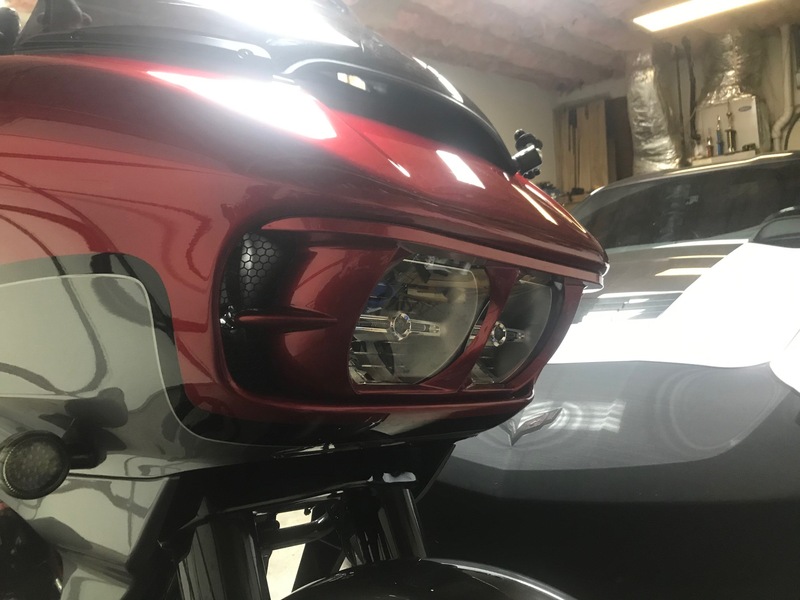 I had to take fairing off any way to install vent screens. I'm just glad its not the total PIA like the 13 and earlier road glides were. My last two CVO's I did not run Tour packs. I put a T-Bag route 66 on rear seat. 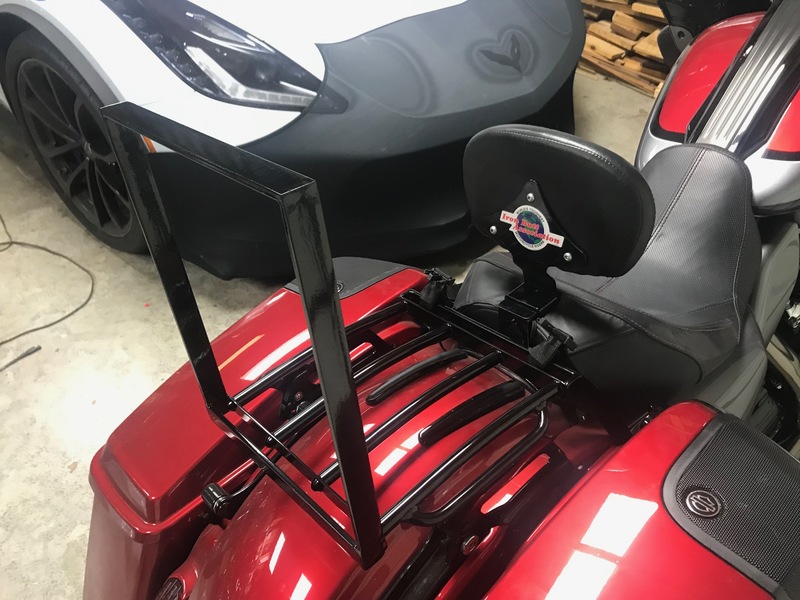 Works great, however when not traveling the rear seat is removed. There are always small scratches that have to be polished out. 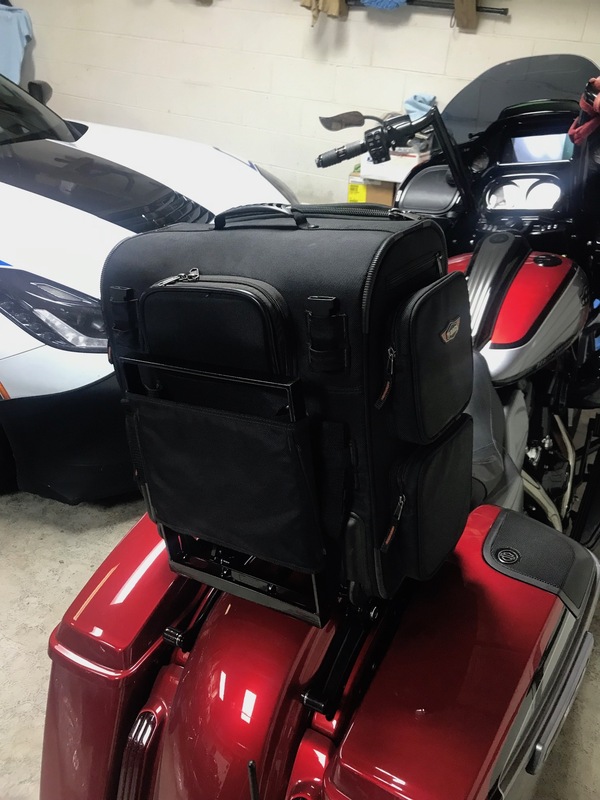 HD does not make a solo mount rack to carry a larger bag like the T-Bag route 66. So I chose to modify the HD solo rack. Had an upright added to the rear. Had a wider bar added to front so it will not cut straps. Then had it powder coated. It will only be on bike when a bag is on the bike. The bag has a roll top bag that clips on top. 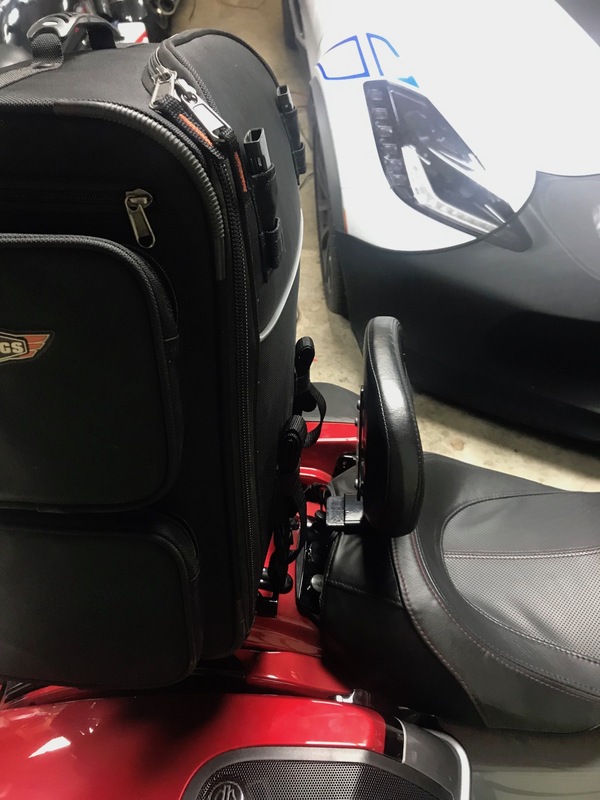 Its also a roller bag. Ready for Daytona. When ya getting in for Daytona and how long ya staying? That is very slick Dave, did you have that piece done at a shop that might want to do another? My wife will be down in Cape Canaveral for the Women in the Wind winter nationals On 6 March. I get off the Rig the 7th and will ride down to meet up with her. We will get to Daytona Sunday the 10th and head home morning of the 13th. Thanks Alan. 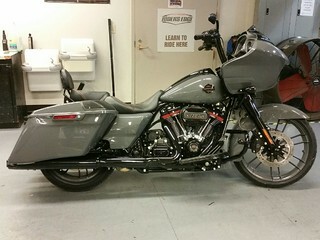 It's the stock Harley Davidson solo rack. I just drew up the additions and had a local fab shop do the work. I am sure he would do another. I would think it would be less to have work done locally than shipping across country. 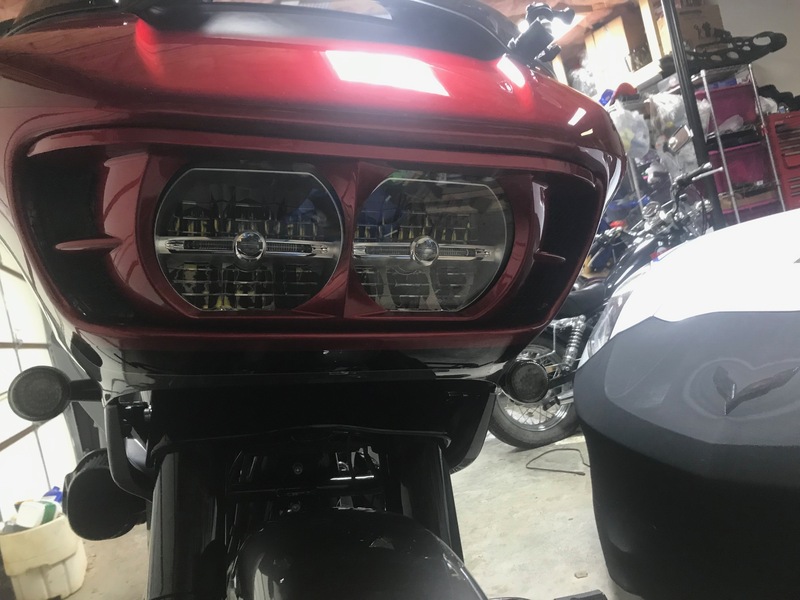 I added the Harley Color Shop, paint matched head light trim piece.